The New KlipPro FF-100 callus remover can be used on wet or dry skin. This is a totally electric unit that can be recharged by USB cable or enclosed AC adapter. Whole Health Supply, owners of KlipPro, is announcing an exciting additional addition to their already popular line of personal care products. The KlipPro FF-100 is an electric callus remover that has five on-board implements for at home nail care. One feature that makes this product stand out it that it is totally electric and can be recharged by the enclosed USB cable or AC adapter. 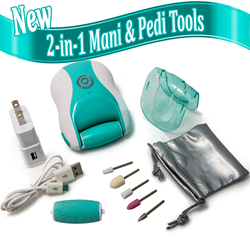 This unit differs from other products on the market because it comes with manicure attachments. In addition the unit has two speeds. There is a Low speed setting of 1250 +- 180rpm for better precision and control and higher power of 1550 +- 800rpm for a speedy grind of larger areas. With a size of 4"x3"x1.7" and weight of only 5 ounces, the shape and design of this callus remover fits right in the palm of your hands making it easier to grasp and control during operation. This product has 2 industry certifications, CE and RoHS, to assure our consumers that the product meets the safety standard for electrical appliances and is free of hazardous materials.